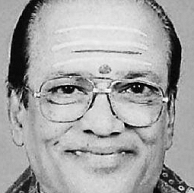 Legendary playback singer, T.M.Soundararajan has been admitted to a private hospital in Mylapore, Chennai due to respiratory difficulties. He is currently being treated in the Intensive Care Unit by a team of doctors. TMS hasn't been keeping good health over the past few months and he has been regularly admitted to hospitals for treatment. He is a nonagenarian at 91 and no one can forget his contributions to the Tamil music scene as the voice of many senior legends like MGR, Sivaji Ganesan and Gemini Ganesan to name a few.